There are many songs (and groups for that matter) from the 80s that may have flew under the radar in North America while enjoying decent success in other countries. 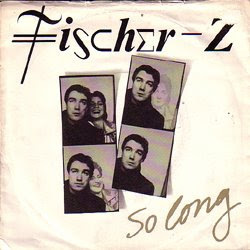 Fischer-Z was one of those groups and "So Long" was one of those songs. Fischer-Z was formed in 1979 in Britain and released nine albums until their split in 2002. The founder and lead singer, John Watts went on to do some solo stuff but never reached the same level of success he did with Fischer-Z. Though they had some hits in the U.K., Portugal, Belgium and Germany, their biggest success was in Australia with a couple of top 20 hits including the song "So Long". It was this success that has confused some to thinking they were actually an Australian band. The video below for "So Long" featured some classic 80s video standards like bad lip syncing, misty atmospheric vibe, a cheap Humphrey Bogart look-a-like, and cheesy interpretation of the story line. Having said that - that's what made the videos from the 80s so memorable. One other interesting note - John Watts lyrics were heavily influenced from his experiences as a mental health care worker. Kind of explains the pain you feel in the lyrics when you listen to this one. Seriously under-rated track from way back.